CarGurus has 478 nationwide Continental GTC listings starting at $39,900. Those with a couple hundred thousand dollars hanging around for a brand new ultra-high-end touring convertible ought to give the 2015 Bentley Continental GTC a look. This drop-top version of Bentley’s sporty Continental GT offers everything its coupe siblings offer, as well as a power-operated convertible roof of four-layer cloth material that’s touted as being nearly as acoustically sound- and weatherproof as the hardtop edition. Boasting once again 4 superbly crafted trims, the GTC V8, the GTC V8 S, the GTC W12 and the flagship GTC Speed, this Bentley convertible remains luxuriously equipped, with some added tweaks inside and out for 2015. Said changes include body-color finishes for the front splitter and side-skirts and a subtly intriguing dark-tint treatment for headlights, taillights and wheels. Red-painted brake calipers are another new cosmetic feature, as are additional choices for interior fabrics, inserts and stitching. Perhaps the most notable change for 2015, though, is some added oomph in the recently introduced GTC Speed’s twin-turbocharged 12-cylinder (W12) powerplant. This 6.0-liter twin-turbocharged engine now puts out 626 hp and 605 lb-ft of torque, as opposed to last year’s 616 hp and 590 lb-ft. Meanwhile, the ZF 8-speed shiftable automatic transmission returns, again boasting steering-wheel-mounted “Quickshift” paddle shifters. Look for a 0-60 time of 4.1 seconds out of this posh yet agile high-end rag-top, with Bentley claiming its blown W12 is the most powerful engine it has ever produced, capable of a touted top speed of 203 mph. Premium gas is de rigueur of course, and for those who care, fuel economy is estimated at 12 mpg city/20 highway. Oh, and this blown 12-banger is also ethanol-capable (FFV). The same FFV twin-turbo 6.0-liter W12 graces the Continental GTC W12 but without the added ponies of its Speed sibling. Combined with the 8-speed shiftable automatic, this stock powertrain throws down 567 hp and 516 lb-ft of torque, with mileage numbers again running an estimated 12/20. Both the GTC V8 and the V8 S justify their monikers by packing a twin-turbocharged 4.0-liter V8 engine along with the ubiquitous 8-speed shiftable automatic transmission. However, the base V8 puts out 500 hp and 487 lb-ft of torque, while the V8 S adds a few more ponies to pound out 521 hp and 502 lb-ft of torque. Additionally, the “S” in the V8 S results from the 8-speed shiftable automatic adding more precise shifting capabilities and a quicker throttle response to an enhanced aerodynamic design for a claimed top speed of 192 mph. Both V8 drivetrains, meanwhile, are estimated at 14/24 and again burn only premium gasoline. By the way, let it not be said that these shifty drop-tops lack agility. All GTC variations once more pack standard full-time all-wheel drive (AWD) that permanently thrusts 60% of torque to the rear wheels and 40% to the front wheels for an agility that’s uncommon in lesser grand touring automobiles. Of course, VW-owned Bentley is traditionally synonymous with over-the-top posh, but the GTC lineup departs a bit from that heritage in riding on VW’s “D” chassis instead of the usual Rolls-Royce underpinning, resulting in an arguably more affordable elite automobile. Make no mistake, however, the British automaker’s GTC line reflects its peerage with, depending on the selected trim, things like 20- and 21-inch alloy wheels, a silky smooth power-operated convertible roof, premium leather and hand-stitched upholstery, top-quality interior accent materials, genuine wood, chrome and carbon fiber inserts and a power trunk lid. All GTC trims also sport adaptive cruise control and power-adjustable telescoping tilt-wheel steering, as well as heated, power-adjustable front seats with memory for driver's settings and dual-zone auto climate control. Both the GTC W12 and the GTC Speed additionally sport a self-leveling suspension, with the GTC Speed throwing abundantly comfy sport front seats into the mix. Once more, GPS navigation is standard in the GTC V8 S and both W12-bearing trims, and remains integrated with an 8-inch touchscreen infotainment display that also supports either a 6-CD changer (GTC V8) or a single-CD player (higher trims with navigation), 8 speakers, satellite radio and optional video capability. Front and rear parking sensors are also standard in select trims, while Bluetooth hands-free technology and a remote garage door opener come standard in each GTC iteration. Options, you ask? Again in keeping with tradition, Bentley’s GTC lineup offers individualized specs that go far beyond their brochure depictions in material and color choices, seating configurations, convenience adornments and comfort niceties. Some popular available add-ons, however, include a rear-view camera, chrome sport exhaust pipes, upgraded audio and massaging and air-conditioned front seats. As is common, many of these available features are found in package form, or “Specifications” in Bentley-speak. Finally, standard mandated safety equipment like 4-wheel antilock brakes (ABS), side-mounted and head airbags, and traction and stability control are bolstered by front and rear side-mounted thorax airbags, LED daytime running lights, front fog/driving lights, turn-signal-integrated mirrors and self-leveling high-intensity-discharge (HID) headlights. The GTC line also sports a super-sophisticated standard remote antitheft alarm system that includes GPS tracking capability. 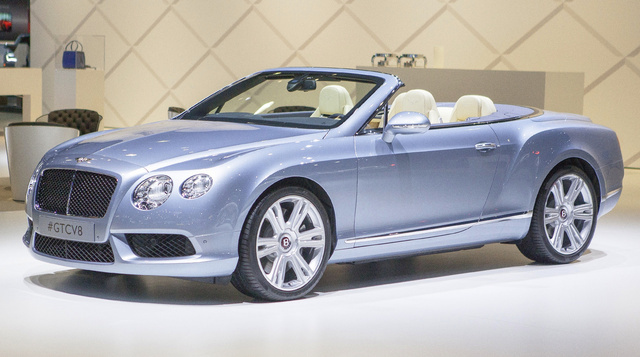 What's your take on the 2015 Bentley Continental GTC? Have you driven a 2015 Bentley Continental GTC?